Picking up a few of these for gift giving this holiday season. I know... cleaning supplies, but I think they're a fun-ish, different gift. 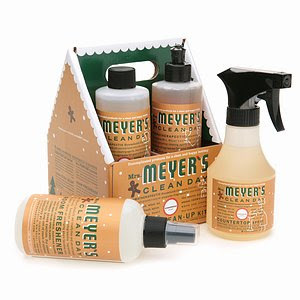 Love lots of Mrs. Meyers' other products, how sweet to have some gingerbread scented supplies to spice up holiday clean-up!? These would make a nice little hostess gift, too. Do they really smell like gingerbread? If so, I'm going to have to get some...yummm! I really like these products, but I haven't yet tried the gingerbread. I think it's a wonderful gift! jenalih - yeah they do smell gingerbready. more ginger than bread, though. very fresh!